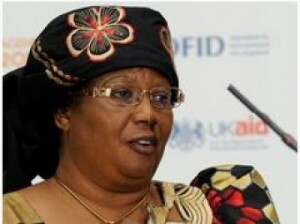 The Malawi government on Thursday, 26 April announced the formation of a new cabinet. This follows the sudden demise of President Bingu wa Mutharika of the Democratic Progressive Party on 5 April. Mutharika died of a cardiac arrest. The new government led by President Joyce Banda of the People’s Party announced the new cabinet which bears new faces including prominent members of opposition parties. The 23-member cabinet includes five portfolios for Banda herself as minister. Banda will now head the ministry of public service, statutory cooperation, disaster and relief, HIV and AIDS and nutrition. Among notable new faces are former vice president Cassim Chilumpha and Atupele Muluzi, a presidential candidate of the United Democratic Front for 2014. A few old faces have been retained in the ministries of finance, foreign affairs, industry and trade, transport, disability and elderly affairs, environment and defence. The changes have raised mixed reactions in Malawian public. Some commentators have hailed Banda for the introduction of fresh blood into cabinet positions. Others uttered concerns that the cabinet shuffle may lead to politics of vengeance as it may be regarded as a punishment to those Mutharika loyalists who have since been fired.